This is the fourth deluxe digipack CD and last of our highly sought after series LAS VEGAS JAN/FEB 1971 engagement. Just like the previous 3 CDs in limited pressing. This CD contains the complete closing show of February 23, 1971. Twenty-two color photos of the same show and a beautiful and rare poster as a centerfold are used to make this a fabulous package Elvis 1971 style! Audio has been restored to a more balanced sound and the missing rare first live version of “Help me make it through the night” is also included! 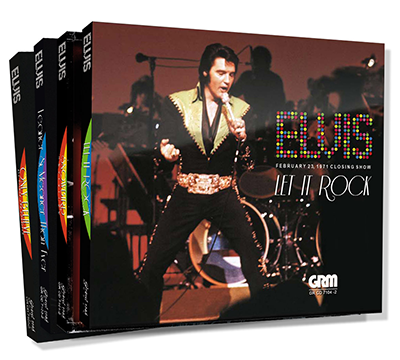 We believe, with our four releases to have captured Elvis at his best! About the show, the quality of performing is truly excellent, Elvis is committed to give an excellent show. Less talkative between songs until the last part of the show, where he start to talk and surprises us with his very first known performance of “Help Me Make It Through The Night”, which he will record only a little while later that same year. Definitive highlights of the show are “Polk Salad Annie”, “How Great Thou Art”,“Bridge Over troubled Water”, “Help Me Make It Through The Night” and the powerful “The Impossible Dream”! Gravelroad Music stands for high quality releases, with very high expectations for both the audio and the packaging and background information. 01 Also Spoke Zarathustra 02 That’s All Right 03 I Got A Woman / By The Time I Get To Phoenix (Excerpt) 04 Love Me Tender / Love Me 05 Mystery Train / Tiger Man 06 Sweet Caroline 07 You’ve Lost That Loving Feeling 08 Polk Salad Annie 09 Something 10 Johnny B Goode 11 How Great Thou Art 12 Don’t Be Cruel 13 Heartbreak Hotel 14 Blue Suede Shoes 15 Bridge Over Troubled Water 16 Little Sister/Get Back 17 Hound Dog 18 Suspicious Minds* 19 The Impossible Dream* Extra Tracks: Audience recording: 20 Suspicious Minds 21 Band Introductions 22 Help Me Make It through The Night 23 The Impossible Dream. Note: * Tracks 18 & 19 are from January 28, 1971 Midnight Show. Together with the other three releases “Snowbird”, “Only Believe” and “Leaner & Meaner Than Ever” you’ll have 4 fantastic sounding soundboards of 1971 with beautiful Booklets, insightful written liner notes, together almost 100 pages , some 100+ photos, rare or in the best quality ever seen! and time related souvenirs! A truly great audio and visual collection of the January / February 1971 Las Vegas engagement! Would love to see ftd use this kind of art but its way too classy looking for them! It has already been released a few years ago..when you don`t have the original you can now grab your copy.. a fine show and a soundboard recording....too important to be skipped ...also great layout. Exceptional Cover! Beautiful theme! Top item! Welcome back Gravel Road! - a MUST have.